Investing in promising cancer research is the primary path to “See a Cure” and since its founding in 2003, OMF has distributed over $350,000 in research grants. For the past three years, OMF has partnered with the American Association of Cancer Research (AACR) to present an annual, peer-reviewed research award to a postdoctoral or clinical research fellow to conduct ocular/uveal melanoma research. These grants not only provide funding for ocular melanoma research, they also encourage promising doctors/researchers to establish a successful career path in ophthalmology, ocular oncology, melanoma biology, or a similar field. ​Dr. Chua's reseach focuses on how bromodomain protein inhibitors can effectively reduce metastatic UM cell growth. A second aim of the research is to investigate whether cells in the liver microenvironment would produce factors/proteins that may alter the responses of UM tumor cells to bromodomain inhibitors. ​Synopsis: After treatment of primary uveal melanoma tumors, 50% of patients will develop macro-metastases and currently there are no FDA-approved targeted inhibitor treatments for metastatic UM. MEK-ERK1/2 signaling is activated frequently in uveal melanoma due to driver mutations in either GNAQ or GNA11. While MEK inhibitors are FDA-approved in cutaneous melanoma, they provide a 14% response rate and modestly improve progression-free survival in uveal melanoma. Dr. Teh’s proposal aims to utilize an in vivo reporter model to monitor the effects of the combination of MEK and CDK4/6 inhibitors and to identify optimal dosing schemes for this combination. Additionally, she will work on determining the effect of BAP1 status in the modulation of response to the combination leveraging new metastatic uveal melanoma cell lines, a new in vivo metastatic colonization model, and uveal melanoma patient samples from clinical trials. Dr. Teh hopes to ultimately provide the pre-clinical basis for targeted inhibitor combinations in late-stage uveal melanoma. Findings: Although Dr. Kurtenbach’s research is ongoing, initial results found PRAME mRNA as the most significant predictor for metastasis in Class 1 tumors. These results have been published in “Clinical Cancer Research” (http://clincancerres.aacrjournals.org/content/22/5/1234). Synopsis: Dr. Shoushtari helped coordinate a randomized, multicenter trial combining a MEK inhibitor called trametinib with/without an AKT inhibitor called GSK2141795. This represented a novel approach to treating ocular melanoma and tested the scientific hypothesis that combined MEK and AKT inhibition is better than MEK inhibition alone. As part of the clinical trial, tumor biopsies were taken before and during treatment. Dr. Shoushtari and colleagues analyzed the genetic changes during treatment in the biopsy specimens and compared patients whose tumors responded to therapy with those whose tumors did not respond to therapy. Comparing these tumors will help shed light on how uveal melanomas rely on MAPK, AKT, or other growth signaling pathways to grow. The results of the research are being applied to help plan new approaches to treating uveal melanoma, and will be generalizable to other types of tumors that rely on these growth pathways. Findings: Two benefits of the study were the amassing of the largest annotated biorepository of uveal melanoma and cultivating the research across multiple centers in the United States and Europe. In Shoushtari’s words, “The fact that we were able to accrue rapidly across multiple centers shows unequivocally that multicenter trials in this rare disease can be conducted efficiently.” Dr. Shoushtari is now a board-certified medical oncologist. He works at Memorial Sloan Kettering Cancer Center in NYC. His clinical expertise is uveal melanoma. Dr. Shoushtari is now a board-certified medical oncologist. He works at Memorial Sloan Kettering Cancer Center in NYC. His clinical expertise is uveal melanoma. 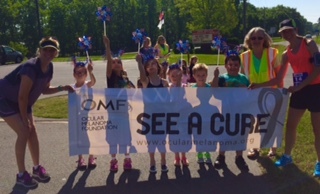 Help Us "See A Cure"
If you are interested in helping to raise funds to support OM research efforts, email Holly, OMF Program Director and Warrior Lead, at holly@ocularmelanoma.org.